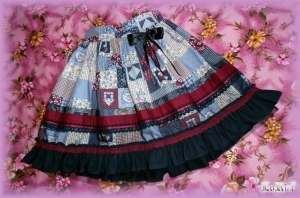 Black Wine Almondica skirt is combination of melancholic taste of patchwork pattern and materials of red wine with black colors. All fabrics are blended with black tulle. which is giving impression on the colorful patchwork background. Waistband is made half-elastic, which is giving more adjustment to wearer. The zipper and buttons are on the side of skirt. Ribbon decoration part is detachable. 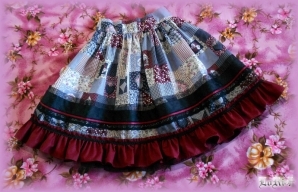 The second version of the skirt from the collection Black Wine Almondica is almost identical, with the swapped color combination of the black fabric with a fine cross pattern and a tufted burgundy bottom frill. The laces are swapped as well, but generally it looks as its predecessor, only with small piece of something new. Headdress designed specifically to Black Wine Almondica collection brings together a combination of the original basis of patchwork print and decoration from black lace and satin ribbons.